Are you suffering from inflammation, swelling or other painful symptoms of Foot Bursitis? Is Foot Bursitis pain affecting your work, sleep or lifestyle? 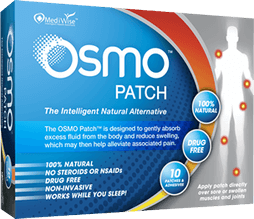 Discover how the OSMO Patch, in combination with proper rest, may be one of the most important decisions you can take towards becoming pain free and regaining your quality of life again. To learn more about foot bursitis and how the OSMO Patch in conjunction with proper rest is used to relieve the pain and reduce the inflammation and swelling associated with bursitis in the feet please continue reading below. Throughout the body there are hundreds of small lubricated sacs that act as cushions to help reduce friction and pressure between bones, tendons and muscles moving across each other… these are called bursas. These bursa sacs are also located throughout the foot and when the foot undergoes stress or other injury then they can become inflamed and swell causing intense pain and discomfort… this condition is known as foot bursitis. What are some of the signs & symptoms of foot bursitis? Normally your doctor will recommend painkillers, anti-inflammatory medication, or a cortisone steroid injection. Occasionally surgery may even be suggested by some doctors when bursitis persists and ongoing pain becomes unbearable. Many people would have already tried one or more of the above treatments with little to no benefit. Some people may have pre-existing medical conditions or allergies that do not allow them to use certain medications. Some people may simply prefer to avoid painful injections or strong medications and instead opt for a natural bursitis foot treatment. Fortunately, the OSMO Patch now offers an Intelligent & 100% Natural Alternative method to treat foot bursitis! The OSMO Patches have been especially developed to draw fluid out of the body, reducing swelling and the associated pain in conditions such as bursitis in the foot. Simply stick the OSMO Patch over the area of the foot where pain or inflammation occurs prior to going to sleep. The patches will then go to work reducing inflammation by removing fluid and stimulating blood flow continually all through the night while you sleep. Then when you wake in the morning the used patch is removed and simply discarded. So if you are ready for a natural & effective approach to supporting the relief of inflammation and pain caused by bursitis in the foot then the OSMO Patch is the Answer! Disclaimer: The information on this page is intended for individuals who have been medically diagnosed with bursitis in the foot. If you suspect that you have bursitis in the foot then it is important to visit a qualified medical professional in order to rule out any other possible causes prior to considering any advice or treatment option.